(Chicago, Illinois) – Faith leaders across eight Great Lakes states are urging their members to participate in an Earth Day 2008 challenge to collect one million pounds of electronics and more than one million pills because trust is needed between all people to stop an environmental crisis. The U.S. Environmental Protection Agency Great Lakes 2008 Earth Day Challenge has moved into high gear more than 100 projects involving hundreds of communities are collecting pharmaceuticals, electronics and household poisons. 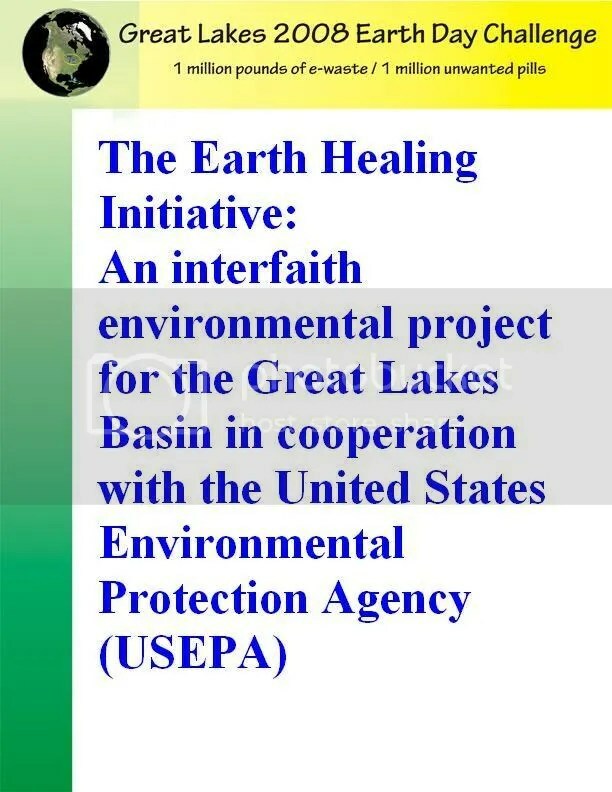 An EPA grant to the non-profit interfaith Earth Healing Initiative (EHI) is mobilizing religious communities in Michigan, Illinois, Indiana, Wisconsin, Minnesota, Ohio, New York and Pennsylvania. A Lutheran Bishop who has participated in interfaith Earth Day recycling projects for three years in a row encourages people of all faiths to get involved and help protect the environment. We are in an environmental crisis in many ways, said Lutheran Bishop Thomas A. Skrenes of the Northern Great Lakes Synod (NGLS) of the Evangelical Lutheran Church in America (ELCA). The Great Lakes watershed is really kind of a mother to all of us here in the populated areas of the upper Midwest. Interfaith environment projects like the EPA Great Lakes 2008 Earth Day Challenge will help ensure a better future for all humans, Skrenes said, adding sometimes its relationships and trusting each other that really count in environmental work. The culture, the society and the environment are now connecting in some fantastic new ways to build relationships between people, Skrenes said. We are building trust along and across denominational lines, in the Christian communities and into the wider faith communities of the whole country. The EHI is a coalition and partnership of churches, synagogues and other faith traditions joining together and sharing their projects and resources to heal, protect and defend the environment, said founder Rev. Jon Magnuson of Marquette, Michigan. Bishop Skrenes hopes everyone across the Great Lakes Basin will participate in their local project. Saying its not your grandfathers environment movement anymore, Skrenes said that environmental work is now more mainstream and no longer an obscure thing for a certain group of people unlike 40 years ago when he was in high school and I dare say some of my relatives said it was kind of a hippie movement. The church is called to bring people together to be part of the healing, Skrenes said. This interfaith earth healing effort is really a great gift that has been given to all of us, Skrenes said. It is our calling and our responsibility to assist in renewal and rebuilding – its Gods work and its the work of Gods people. Examples of established interfaith organizations that are assisting the EHI include the University of Minnesota Lutheran Campus Ministry, the Arrowhead Interfaith Council in Duluth, the Marquette University Ministry outlets in Milwaukee, several Catholic interfaith groups and the office of Ecumenical Formation and Inter-Religious Relations at the Evangelical Lutheran Church in America. EPA grants to some of the organizers help fund projects aimed at recycling computers, cell phones and other electronics commonly known as “e-waste plus collecting out-of-date and unwanted pharmaceuticals for proper disposal in high tech incinerators. To comply with federal drug laws, police officers and pharmacists are accepting the medications. While some of the projects have been running all month or during Earth Week, the bulk of the events will be held either this Saturday, April 19 or next Saturday, April 26. Collections, rules, times and dates vary from city to city. The interfaith EHI is one of numerous environment and Native American projects founded by the non-profit Cedar Tree Institute in Marquette, Michigan including the Earth Keepers, known for removing more than 370 tons of e-Waste, pharmaceuticals and household hazardous waste (HHW) during three Earth Day clean sweeps across the Upper Peninsula. 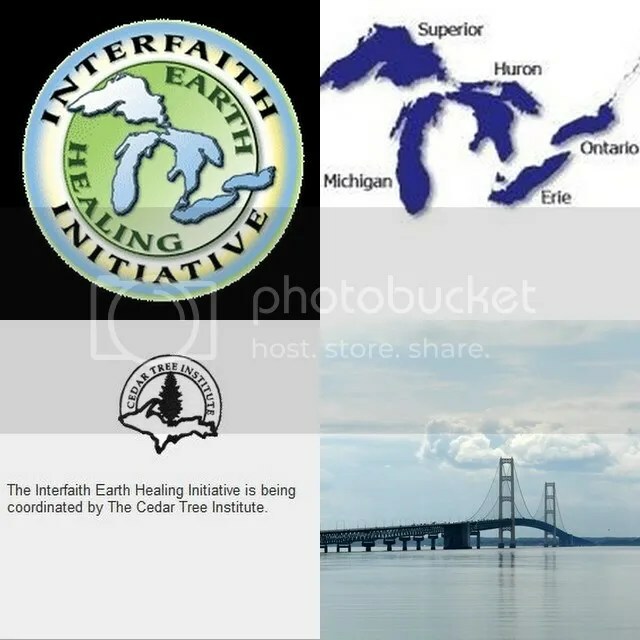 The northern Michigan Earth Keepers have alliances with ten faith traditions across the Upper Peninsula, and the EHI is coordinating the same relationships with religious communities across the Great Lakes and beyond. Bishop Skrenes is among the faith leaders who have signed the northern Michigan Earth Keeper Covenant pledging to actively participate in environment projects, build bridges with others faiths, and reach out to Native American communities. Bishop Skrenes said the interfaith clean sweep is an example for other communities in the world because it shows like-minded people with good hearts can make a real impact in their communities when tackling environmental problem that seem daunting or too big for the average person to really make a difference. The ongoing Earth Keeper project involves the congregations of over 150 churches and temples representing ten faith communities: Catholic, Episcopal, Lutheran, Presbyterian, United Methodist Church, Unitarian Universalist, Bahá’í, Jewish, Zen Buddhist and the Religious Society of Friends commonly known as the Quakers. The Upper Peninsula Earth Keepers set up collection sites across a 400-mile area of northern Michigan on Earth Day 2005-2007. About 15,000 residents turned in over 320 tons of e-Waste, 45 tons of HHW including car batteries, oil-based paint, pesticides, liquid mercury, and other common poisons and over one ton of pharmaceuticals including $500,000 in narcotics. People of many spiritual dimensions resonate to this work, Skrenes said. This is a good effort for all of us to be involved with. This is about the environment, this is about cleaning up and making things new again and restoring things to the ways they once were and can be, Skrenes said. People who are spiritual reflect upon and think about creation, Skrenes said. We think about the lakes and the streams and the forest and all of the rest that God has produced. The 2008 EPA challenge collection sites in large cities and surrounding areas like Chicago, Milwaukee and Cleveland. New York: Brockport, Buffalo, Fredonia, Rochester (two events), Syracuse (two events). Wisconsin: Appleton, Brillion, Chilton, Crandon, Green Bay, Keshena (Menominee Indian Tribe of Wisconsin and College of Menominee Nation), Manitowoc, Milwaukee (two events), New Holstein, Oshkosh, Plover (two events), Racine, Superior, Waupaca. The EHI is organizing faith community volunteers and participants plus providing free media assistance to the Earth Day projects including press releases, press contacts, internet videos, podcasts and postings. For more information on the EHI project call 906-401-0109. This entry was posted in ABC, ABC News, Abenaki, acid, acid mine, acid mine drainage, AIM, air, Akime, Akimel, Alabama-Coushatta, Aleut, Alton, American Indian, Ann Arbor, Apache, Apalachee, Appleton, Arapaho, Arikara, Arkansas, Art Neskahi, Assiniboin, Aurora Borealis, Bahai, Bannock, Bay City, Beecher, Bellwood, Benton Harbor, Bishop, Blackfoot, Blaine, Bless, blessing, Bloomfield Hills, Bolingbrook, Brillion, Brockport, broken, Brooklyn Park, Buffalo, Cable News Network, Caddo, Canarsee, Carol Stream, Catawba, Cayuga, Cayuse, CBS, CBS News, cell phones, ceremony, Channahon, Cherokee, Cheyenne, Chicago, Chickasaw, Chilton, Chinook, Chippewa, Choctaw, Christian, church, Cleveland, climate, climate change, CNN, Coeur d'Alene, College of Menominee Nation, Columbia City, Colville, Comanche, communities, Community, computers, conference, Cortez, Cortez Journal, Crandon, Cree, cross, Crow, crow creek, culture, Cuyahoga County, Dakota, Dearborn Heights, Delaware, Detroit, Detroit Free Press, Detroit News, Diné, diocese, disposal, drinking water, Duluth, e-waste, Eagan, eagle, Earth, earth day, Earth Day 2008, Earth Healing Initiative, Earth Keeper Initiative, Earth Keepers, East Lansing, ecology, ecumenical, Eden Prairie, EHI, ELCA, electronics, Elk Grove Village, Elmhurst, English, environment, environmental, EPA, Episcopal, Erie, Eskimo, Evangelical Lutheran Church of America, faith, faith traditions, faith-based, Farmington Hills, fight, First Nations Peoples, fish, Flathead, food, Fort Wayne, Fox News, Fredonia, Gary, glacier, Glenview, global warming, God, Goodells, grain, Great Lakes, Great Lakes 2008 Earth Day Challenge, Great Sioux Nation, Green Bay, Gros, Grove City, Haida, Hammond, Harbor Springs, Harlan McKosato, heritage, HHW, Hidatsa, Hoopa, Hopi, household hazardous waste, Huron, ice caps, Illinois, incinerator, Indian, Indiana, indigenous, Indigenous Issues, Indigenous peoples, interfaith, intolerance, Iroquois, Islam, Islamic, Jesus, Jewish, Joliet, justice, Kalispel, Kansa, Kaw, KBIC, Kent, Keweenaw Bay Indian Community, Kickapoo, Kiowa, Klallam, Klamath, Knox, Kootenai, Kwakiutl, l O'Odham, lake, Lake Erie, Lake Huron, Lake Michigan, Lake Superior, Lakota, Lakota Sioux, Lancaster, landfill, landfills, Lansing, LaPorte, Lockport, Lombard, Lord, love, Lumbee, Lutheran, Lutheran Campus Ministry, Lutheran School of Theology Chicago, Madison, Mahican, Maidu, Makah, Malecite, Mandan, Manhattan, Manitowoc, Maple Grove, Maricopa, Marquette, Mdewakanton, media, medical care, Medicine Cabinet Clean Out Day, medicines, melting, Mendota, Menominee, Menominee Indian Tribe of Wisconsin, Michigan, Micmac, Midland, Milwaukee, Milwaukee Journal, Milwaukee Sentinel, Minnesota, Mission Indians, Modoc, Mohave, Mohawk, Mohegan, Monroe, Montagnais, Mount Prospect, multicultural, Muskogee Creek, mutation, Narragansett, Naskapi, Natchez, national public radio, national talk show, Native America Calling, Native American, Native American Theology, nature, Navajo, Navajo Times, NBC, NBC News, New Holstein, New Mexico, New Ulm, New York, New York City, news, newspaper, Nez Percé, NMU 2008 Indigenous Earth Day Summit, non-profit, Nootka, north, North American, North American Theology, Northbrook, northern, northern lights, Northern Michigan University, Northern Michigan University Native American Studies, NPR, O'Odham, Ohio, Ojibwa, Ojibwe, Okanogan, Oklahoma, Omaha, Oneida, Onondaga, Osage, Oshkosh, Oto, Ottawa, Paiute, Papago, Park Ridge, Patriotic, Pawnee, Pennacook, Pennsylvania, Penobscot, Pequot, Perrysburg, pharmaceutical waste, pharmaceuticals, pills, Pima, planet, Plover, pluralism, poisons, pollution, Pomo, Ponca, Pope, Potawatomi, Powhatan, prejudice, Presbyterian, proper disposal, Pueblo, Puyallup, Quapaw, Quechan, Racine, racism, radio, recycle, religion, religions, respect, Rev Jon Magnuson, river, rivers, Rochester, Roman Catholic, Rome, Romeoville, Rosebud, Royal Oaks, Rushville, Sabaoth, Sacagawea, Saint Cloud, Salish, Sandusky, Santee, Sarsi, Sauk, Sault Ste Marie, See Sac, Seminole, Seneca, Shakopee, Shawnee, Shorewood, Shoshone, Shuswap Sioux, Sioux, Sioux Nation, South Dakota, Southfield, Southwest Intertribal Voice, species, species extinction, Spokan, Springfield, St Louis Park, St Paul, state of Michigan, stream, streams, sulfide, sulfide mine, Sulfide mining, sulfuric acid, Superior, Syracuse, television, Tillamook, Tillie Black Bear, Tlingit, Tobacco Nation, Tohono, Toledo, tradition, Traverse City, tree, trees, tribal, tribe, Tribune, truth, Tsimshian, Turtle Island, Turtle Island Project, Tuscarora, TV, Uncategorized, United Methodist Church, United Nations, United States, United States Environmental Protection Agency, Universalist Unitarian, University of Minnesota, unwanted, Upper Peninsula, USEAP, Ute, UU, Valparaiso, Ventre, Villa Park, volunteer, Wahkon, Wampanoag, Wappinger, Warren, Washo, water, Watersmeet, Waupaca, West Chicago, Western Lake Superior Sanitary District, Wheaton, Wichita, wild rice, wildlife, Winnebago, Wisconsin, WITW, Woodstock, world, world news, Wyandot, Yakima, Yamasee, Yankton Sioux, Yellow Dog Plains, Yokuts, Yuma, Yurok and tagged ABC News, Abenaki, acid, acid mine, acid mine drainage, air, Akime, Akimel, Alabama-Coushatta, Aleut, Alton, American Indian, Ann Arbor, Apache, Apalachee, Appleton, Arapaho, Arikara, Arkansas, Art Neskahi, Assiniboin, Aurora Borealis, Bahai, Bannock, Bay City, Beecher, Bellwood, Benton Harbor, Blackfoot, Blaine, Bless, Bloomfield Hills, Bolingbrook, Brillion, Brockport, broken, Brooklyn Park, Buffalo, Cable News Network, Caddo, Canarsee, Carol Stream, Catawba, Cayuga, Cayuse, CBS News, cell phones, ceremony, Channahon, Cherokee, Cheyenne, Chicago, Chickasaw, Chilton, Chinook, Chippewa, Christian, church, Cleveland, climate, climate change, CNN, Coeur d'Alene, College of Menominee Nation, Columbia City, Colville, Comanche, communities, computers, conference, Cortez, Cortez Journal, Crandon, Cree, cross, Crow, crow creek, culture, Cuyahoga County, Dakota, Dearborn Heights, Delaware, Detroit, Detroit Free Press, Detroit News, Diné, diocese, disposal, drinking water, Duluth, e-waste, Eagan, eagle, Earth, earth day, Earth Day 2008, Earth Healing Initiative, Earth Keeper Initiative, Earth Keepers, East Lansing, ecology, ecumenical, Eden Prairie, EHI, ELCA, electronics, Elk Grove Village, Elmhurst, environment, environmental, EPA, Erie, Eskimo, Evangelical Lutheran Church of America, faith, faith traditions, faith-based, Farmington Hills, First Nations Peoples, Fort Wayne, Fox News, Fredonia, Gary, glacier, Glenview, global warming, God, Goodells, grain, Great Lakes, Great Lakes 2008 Earth Day Challenge, Great Sioux Nation, Green Bay, Gros, Grove City, Haida, Hammond, Harbor Springs, Harlan McKosato, heritage, HHW, Hidatsa, Hoopa, Hopi, household hazardous waste, Huron, ice caps, Illinois, incinerator, Indian, Indiana, indigenous, Indigenous Issues, Indigenous peoples, interfaith, intolerance, Jesus, Jewish, Joliet, Kansa, KBIC, Kent, Keweenaw Bay Indian Community, Kickapoo, Kiowa, Klallam, Klamath, Knox, Kootenai, Kwakiutl, l O'Odham, lake, Lake Erie, Lake Huron, Lake Michigan, Lake Superior, Lakota, Lakota Sioux, Lancaster, landfill, landfills, Lansing, LaPorte, Lockport, Lombard, Lumbee, Lutheran, Lutheran Campus Ministry, Madison, Mahican, Maidu, Makah, Malecite, Mandan, Manhattan, Manitowoc, Maple Grove, Maricopa, Marquette, media, medical care, Medicine Cabinet Clean Out Day, medicines, melting, Menominee, Menominee Indian Tribe of Wisconsin, Michigan, Midland, Milwaukee, Milwaukee (two events), Milwaukee Journal, Milwaukee Sentinel, Minnesota, Mission Indians, Modoc, Mohave, Mohawk, Mohegan, Monroe, Montagnais, Mount Prospect, multicultural, mutation, Narragansett, Naskapi, Natchez, Native America Calling, Native American, Native American Theology, nature, Navajo, Navajo Times, NBC News, New Holstein, New Mexico, New Ulm, New York, New York City, news, newspaper, Nez Percé, NMU 2008 Indigenous Earth Day Summit, non-profit, Nootka, North American Theology, Northbrook, northern, Northern Michigan University, Northern Michigan University Native American Studies, O'Odham, Ohio, Ojibwa, Ojibwe, Okanogan, Oklahoma, Omaha, Oneida, Onondaga, Osage, Oshkosh, Oto, Ottawa, Paiute, Papago, Park Ridge, Patriotic, Pawnee, Pennacook, Pennsylvania, Penobscot, Pequot, Perrysburg, pharmaceutical waste, pharmaceuticals, pills, Pima, planet, Plover, pluralism, poisons, pollution, Pomo, Ponca, Pope, Potawatomi, Powhatan, prejudice, Presbyterian, proper disposal, Pueblo, Puyallup, Quapaw, Quechan, Racine, racism, recycle, religion, respect, Rev Jon Magnuson, river, rivers, Rochester, Roman Catholic, Rome, Romeoville, Rosebud, Royal Oaks, Rushville, Sabaoth, Sacagawea, Saint Cloud, Salish, Sandusky, Santee, Sarsi, Sauk, Sault Ste Marie, See Sac, Seminole, Seneca, Shakopee, Shawnee, Shorewood, Shoshone, Shuswap Sioux, Sioux, Sioux Nation, South Dakota, Southfield, Southwest Intertribal Voice, species, species extinction, Spokan, Springfield, St Louis Park, St Paul, state of Michigan, stream, sulfide, sulfide mine, Sulfide mining, sulfuric acid, Superior, Syracuse, Tillie Black Bear, Tobacco Nation, Toledo, tradition, Traverse City, tree, trees, tribal, tribe, Tribune, truth, Tsimshian, Turtle Island, Turtle Island Project, Tuscarora, TV, United Methodist Church, United Nations, United States, United States Environmental Protection Agency, Universalist Unitarian, University of Minnesota, unwanted, Upper Peninsula, USEAP, Ute, UU, Valparaiso, Ventre, Villa Park, volunteer, Wahkon, Wampanoag, Wappinger, Warren, Washo, water, Watersmeet, Waupaca, West Chicago, Western Lake Superior Sanitary District, Wheaton, Wichita, wild rice, wildlife, Winnebago, Wisconsin, WITW, Woodstock, world, world news, Wyandot, Yakima, Yamasee, Yankton Sioux, Yellow Dog Plains, Yokuts, Yuma, Yurok. Bookmark the permalink.